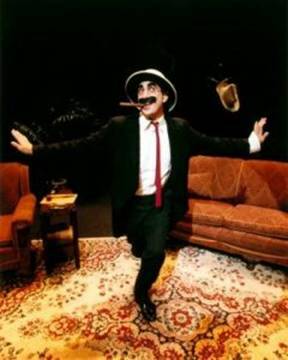 SAN JOSE, CA – “Why GROUCHO MARX?” Cultural World Bilingual asks Award-winning actor/director/playwright and Producer FRANK FERRANTE, who will come to S.J. 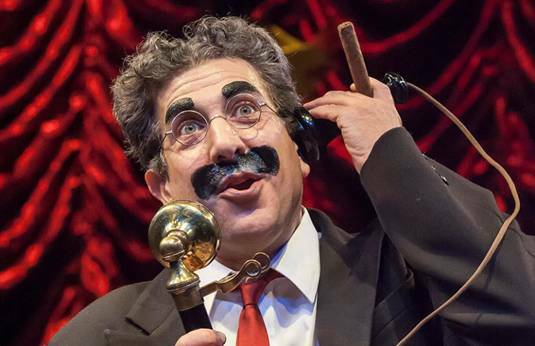 to impersonate the legendary star, in AN EVENING WITH GROUCHO, a two act comedy show that will be presented on April 6 and 7 at the 3 BELOW theaters & Lounge. “Why did I pick this character, to portray?” he asks, before answering: “I fell in love with GROUCHO MARX, and his brothers, when I was nine years old, and I saw a film of him on television called “A Day at the Races.” I never had seen anything like it, I had never laughed so hard. He was so outrageous, so free and wild, so insane, that a switch was set on, on me. I wanted to be on that world, I wanted to learn about comedy and comedians.GROUCHO was my introduction to comedy. He was also my introduction to theatre, and performance. I owe GROUCHO a great deal, because of his inspiration and impact." 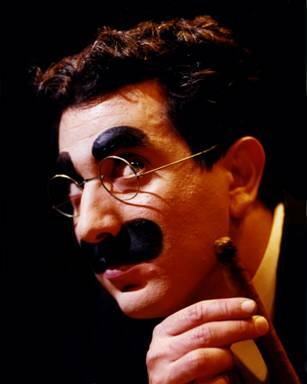 CWB: How do you as an impersonator of GROUCHO define the MARX type of comedy? C.W.B. : What are the difficulties in handling a solo show? F.F. : “For me, it is maintaining my own stamina. It is a very demanding show because it is me, for the ninety minutes two act comedy with music. For the music, II have a piano player, an accompanist by the name of GERALD STERNBACH, and he is a great pianist who had played for many Broadway stars." But to answer your question, the challenge for me is that I need to continue to maintain my strength, physically and remain vocally fit on the stage." C.W.B: Have you ever felt like GROUCHO when you are not on the stage? C.W.B. Can you tell our readers something about your show? F. F.: “This show will make YOU laugh. Every show is different, and the audience is different, so I don’t know what is going to happen, from show to show, which makes each show exciting for me and puts electricity to it, It is also an Award-Winning show which has played internationally. 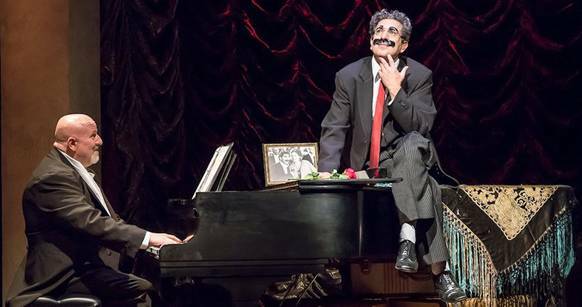 The two-act comedy consists of the best of GROUCHO’s one-liners, anecdotes, and songs, with Mr FERRANTE in the role of GROUCHO, accompanied by his pianist ad-libbing his way throughout the performance. It is a show for all ages. C.W.B. Do you think the Humor of GROUCH) was different from today’s humor? GROUCHO MARX was a comedian, a film and TV actor, a singer and writer. He was also one of the MARX BROTHERS (HARPO, CHICO, ZEPPO, and GUMMO) team of comedy. 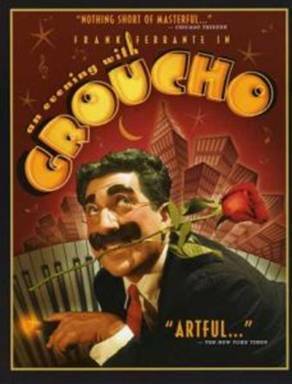 GROUCHO was born on October 2, l890 in New York City from immigrant parents from Germany and from France. He began his career as a singer, but his efforts proved to be disastrous, so, in l914, he changed his career to comedy, making people laugh at themselves with quick-witted quips that won over the crowds. After his fame grew, he began making films with his brothers. In l949, After splitting from his brothers he performed solo on radio and television. He died on august l9, 1977. To order tickets to AN EVENING WITH GROUCHO on April 6 and 7, you can go to https://3belowtheaters.com, or buy tickets at the 3Below Theaters (Formerly Camera 3) 288 South Second St. Downtown San Jose.